Bob Dylan’s Tempest: A storm in your mind. Bob Dylan turns 72 next year. It is fifty years since he released his first album. He was a legend at the age of 25. If his career had ended by Blonde On Blonde (1966) – he would still have been one of rock history's greatest artists. In 2012 Dylan is still going strong. He is painting, writing and touring. And he is still recording. The quality of his later albums has been remarkable. Time Out Of Mind (1997) was a masterpiece, like Love & Theft (2001) and Modern Times (2006). Together through Life (2009) did not quite meet the same sky-high standard. Now it's about "Tempest". The album has such power and is so energetic that it's hard to belive that the album is released by an "older" gentleman. Tempest consist of ten tracks and lasts 68 minutes. No bad tracks. The question is rather how many of them will gain the true Dylan classics status. Tempest provides a complex and a almost complete concept. The impulses cover the musical landscape Dylan has been exploring over the last decades. "Scarlet Town" and "Tin Angel" stands out as instant Bob Dylan Classics. The first one reminds me of “Man in the Long Black Coat” from Oh Mercy 1989. “Tin Angel” is a dark and gloomy story – a real “murder ballad”. Musically “Tin Angel” is a sister or brother of the Modern Times highlight “Ain't Talkin'” – but without a chorus. Dylan is also crossing his own paths in "Long and Wasted Years". In form and narrative it is a relative to "Brownsville Girl” from the otherwise quite bad album “Knocked Out Loaded” 1986. “Pay it in Blood” is fresh and unexpected. It is an amazing rocker – with breathtaking changes and breaks. Tough, rough and the essence of what Rock music is all about. The song might as well have been signed Stones (they should really adopt it and make a cover immediately). The production is unmistakably "Jack Frost" (Bob Dylan). It is rather rough – but when you listen carefully it`s obvious that Dylan is in full control – down to every detail. The sound feels live. Dylan and the musicians' presence is coming through. Any over dubbings are hard to detect. Most of the tracks feel like live recordings with the band in the studio – even though this is hardly the truth. The production has an unusual presence that captures, captivates and engages – and drags us into this fascinating musical journey. Tempest is a rather dark album about betrayal, death and destruction. Dylan is not primarily the philosopher – but rather a storyteller with finesse and power. Again, "Tin Angel" immediately makes the strongest impression. It is a story full of betrayal, pain and death. Dylan is telling the story so grim, dark and deadly accurate that we can literally see the both blood spatter and feel the dark. The musician’s is Dylan's regular touring band. For the occasion Los Lobos David Hidalgo joins the band. Using the touring band is a wise choice. Tempest benefits from a group of musicians that has gained a form of musical safety and creative understanding. The band creates a unified musical foundation, including space for musical playfulness and some improvisation. Tempest stems from years of concerts and musical renewal. That is why "Tempest" seems to be designed for live performances. Over the last years it has been debated whether Dylan's voice is worn out and that he should give in. Tempest should bring this discussion to an end. Dylan's voice is like a sand paper or an old table with tears, wounds and a wonderful patina. He is not spanning the same range as in his early years, but it doesn`t matter. No one sings like Dylan. 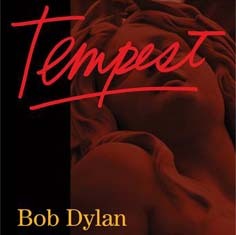 On "Tempest" Dylan sings like you've never heard him before. He is using his aging voice too express himself with a presence, creativity and vitality that makes age and voice complete irrelevant. Dylan manages to challenge himself and create new musical universes and stories. Dylan`s Tempest might be one of his best albums ever. Top ten, top five – who knows and cares,. It is a privilege to meet a storm like this. Dylan is still the most important and most powerful. Whatever scale – Tempest deserves the full score. It is probably one of the best albums released in this century's so far! Tempest is simply going to be a storm in your mind. The text is automaticly translated from Norwegian to English by Google translate. Dette innlegget ble publisert i Bob Dylan, English, Fidelity, Kultur, Uncategorized. Bokmerk permalenken. 3 kommentarer til Bob Dylan’s Tempest: A storm in your mind. Was English the first language this was written in? thank you. auto translation doesn't use grammar.